Arrival at the Bali Airport. Meet the tour representative who helps you with an assisted transfer to the hotel. As you are at the airport, notice that it is a wonderful example of traditional culture, simplicity and modernity. Continue to the hotel. On the way, you come across a huge statue of war scene between Karna and Gatotkacha from the Hindu epic, Mahabharata. After completing the check-in formalities, the day is now at leisure. Explore this beautiful and tranquil island on your own. Post breakfast on day 2, head to Tanjung Benoa beach for partaking in water sports, away from chaos of the city life. The beach is located northwards of Nusa Dua and offers a number of watersports activities such as banana boat ride, jet skiing and parasailing. The shores also have a number of restaurants and beach shacks where you can enjoy drinks and sumptuous delicacies of your choice. The evening is scheduled for a visit to southern Bali, offering an insight into the region's soul. Visit the popular Uluwatu temple, placed on a cliff top, at a height of 825 feet. From the temple, savor the views of the sprawling Indian Ocean and the sun setting in the horizon. Later on, you can enjoy Kecak Dance performance (optional), after sunset. Kecak and Fire Dance is absolutely dreamlike and transports you into another world. As the episode of Lanka Dehan from Ramayana is being showcased, listen to the gripping chant of kecak, kecak' in the background. In the morning, enjoy breakfast. Later, enjoy excursion to the Kintamani Volcano. 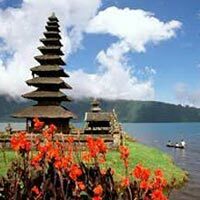 This is one of the most popular day tours in Bali, offering a sneak-peek into the life of the Balinese people. During the tour, visit the Batuan village- known for traditional batik and hand weavings, Mas village- known for wood carvings, and then drive past Celuk village- known for silver and gold works. Next, the visit is to the popular historical and ancient Hindu temples of Bali. Now, visit Mount Batur and Lake Batur in Kintamani village for treating for eyes to the breathtaking views of the surroundings. The day comes to an end in the popular Ubud market. Get your hands on some wonderful souvenirs. Later on, if you want, you can attend Barong Dance performance in Kintamani (optional). This is an extraordinary Balinese dance performance of about an hour, showcasing ever on-going hypothetical war between goodness and badness. After breakfast, get ready for visiting the popular Tanah Lot Temple. One of the most important landmarks in Bali, this temple is known for a stunning offshore setting and wonderful views of the sunset. Located on the top of a cliff, this is an ancient Hindu sacred site with the sea waters in the background. Close to the temple are a number of shops, restaurants, and a cultural park that hosts dance performances on a regular basis. The temple is 20 km northwest of Kuta. Do not forget to capture the scenery in your camera. This visit is going to be a memorable affair. Today is the last day of your tour. Enjoy your breakfast. The rest of the day is at leisure. Later on, get timely transferred to the airport to board the flight for your onward journey.